I had known for months that the creative part of me was locked up, buried deep, and seemed utterly unreachable. I also knew it was part of finding my way back to a pattern of cheerful daily living, but I couldn’t, no matter how I tried, seem to reach that place. I would walk to my sewing table, admire the beauty of the fabrics and the merit of the project, and walk away, unable to sit and turn on the machine. And then one day, with the above quote in my mind (oh, how I needed all those benefits! 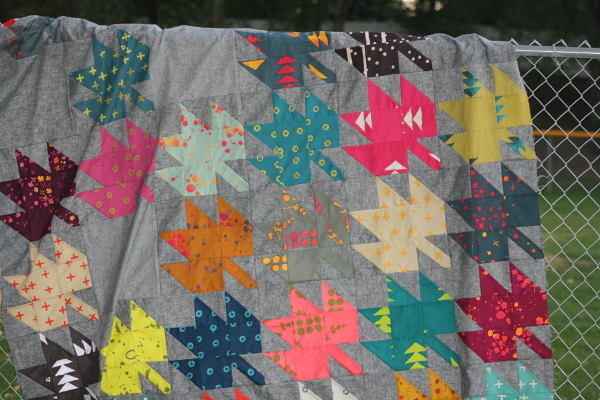 ), the urge to make a modern maples quilt block struck. Out of nowhere. I’d never been tempted to make one, never put it on my list of quilts I’d like to make. Still, it came. With specifics: Alison Glass’ Handcrafted I and II, with a black essex yarn dyed linen as the background. Gratefully I had both on hand and immediately made one. I kept cutting. My sister let me use the rest of her linen while I waited for the additional yardage I’d ordered to come. I kept sewing. It suits where I’m at right now. It’s a bit moodier than most of my sewing, with the dark background and rich jewel toned prints. But it was so much fun to make! 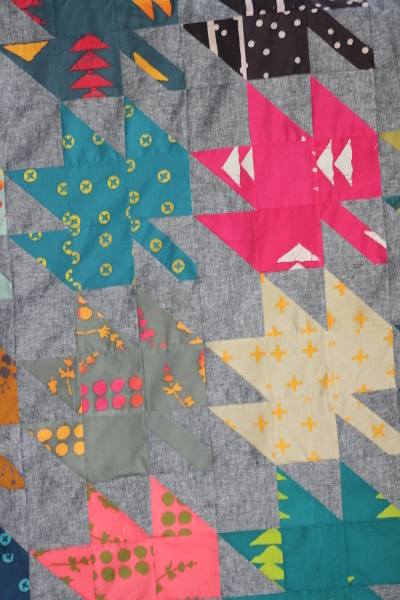 The blocks are fast and easy, and as I ironed each of the Handcrafted fat quarters prior to cutting them I marveled at their beauty, ran my hands across them, appreciated how the murkier colors made the bright, clear colors shine. They reminded me that the murky parts of life I’ve wrestled with this year may someday make the beautiful ones all the better. 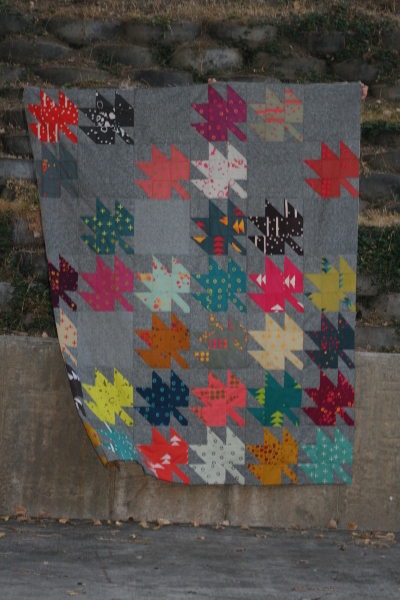 I wasn’t fussy about accuracy with this quilt. No trimming, no pinning, just ironing and nesting seams, and sewing like crazy while the urge still lasted. I’m happy with the outcome. It’s basted and partly quilted, with the wildest use of colored thread I’ve tried to date. Can’t wait to share more! Love it, the background color, the fabrics, all of it! Love! And I love your writing on your last post too. 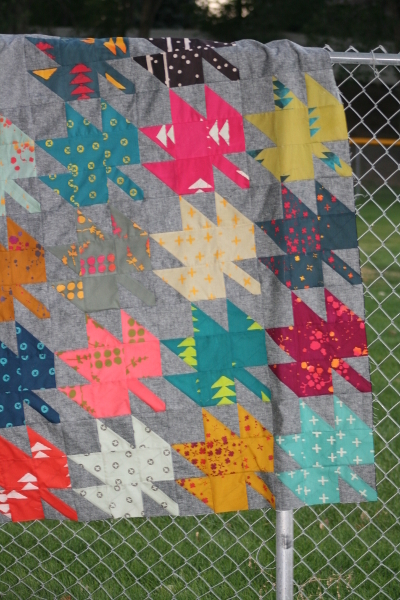 Jennifer you created a very stunning Fall quilt. This is my favorite leaf quilt and I have been searching for a while now. You did a GREAT job!